Easy@Home(UTI-25P) Urinary Tract Infection Test Strips (UTI… | FreebieOrBust Freebies! Welcome to the most fabulous online sweepstakes platform! We have the best deals on the internet, with a wide range of popular products – but you’ll never win if you don’t sign up! 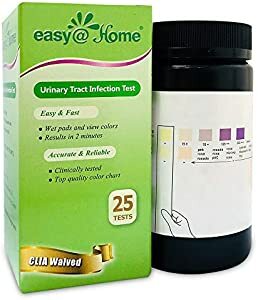 Easy@Home(UTI-25P) Urinary Tract Infection Test Strips (UTI Test Strips) Monitor Bladder or Urinary Tract Issues by Testing Urine, 25 Tests/Bottle-FDA Approved for Over the Counter (OTC) USE, Urinalys. Once you enter, you have a 1:300 chance of winning. Prizes available: 4. Offer hosted by Amazon and Easy@Home. There are 4 prizes to win. Register for the best online sweepstakes platform, and grasp the opportunity to win! Remember – nothing happens without you taking action on your desires – So, what are you waiting for? Sign up for the fastest-growing sweepstakes community today!